An engineering firm recently specified two seemingly unrelated Plast-O-Matic valves to provide redundant siphon prevention in a ferric chloride piping system. The primary valve, Series RVDT Backpressure/Relief Valve, was selected for its PTFE diaphragm and normally-closed design. When the pump is activated, and pressure builds above the set point, the RVDT opens and allows flow. The set point is based on the total feet of head in the tank plus a safety factor. When the pump is shut off, pressure drops below the set point. 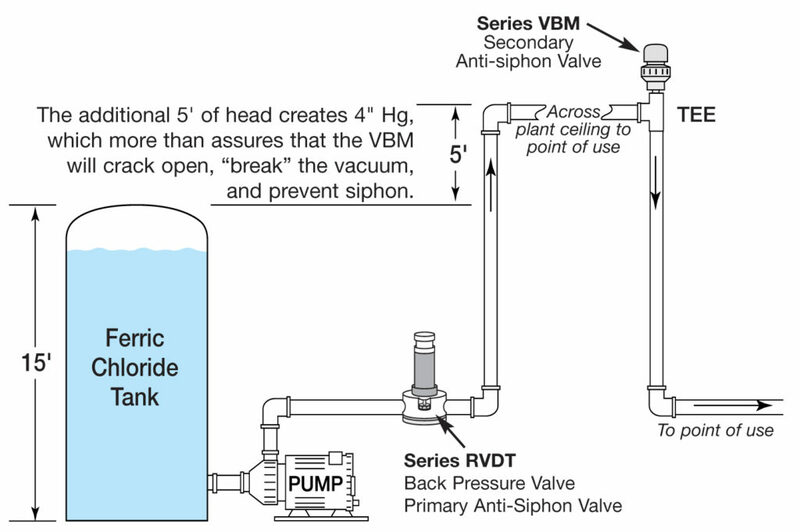 This causes the RVDT to automatically close bubble tight, and siphoning due to tank head pressure is prevented. When the pump is shut off, vacuum occurs as liquid drains from the highest point to the lowest point in the piping system. This downstream flow creates a vacuum, and as flow continues, it creates a siphoning effect and drains the tank of ferric chloride. The most sensible plan was to use a normally-closed vacuum breaker that would positively seal bubble tight under even the lowest pressure, but open at minimal vacuum should the primary anti-siphon valve fail. Plast-O-Matic Series VBM, by virtue of its patented diaphragm, was the only product available to meet this requirement.